Welcome to this weeks Wednesday Challenge! 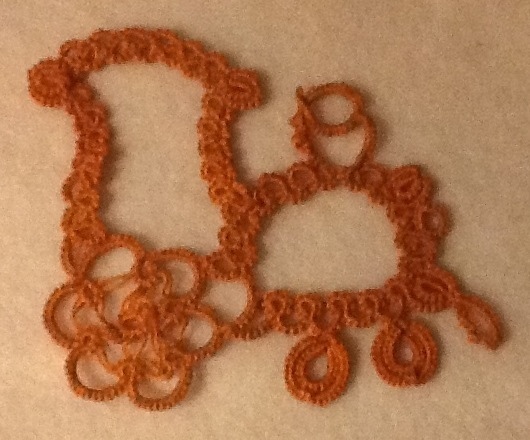 This week, I decided to rework a pattern from an antique tatting magazine in my collection. While I love working the patterns, I hate trying to interpret they way the wrote them out. I have included a picture and a screen print of the original printing for your enjoyment. Center Ring: 2p4p4p4p4p4p4p4p2. Close, tie off, hide ends. Continue with other pattern from split ring. I have also removed several picots because in my opinion, they make the edges look to busy. All picots are 1/4 inch on the Handy Hands picot gauge except the joins in the medalion where I used the smallest so the clovers will hold their shape better. I used Lizbeth 20 number 137, Berry Burst wound on 2 shuttles, Continuous Tread Method. Center Ring: 4p4p4p4p4p4p4p4. Close and prepare mock picot. Connect to space between split ring and the first top ring. Tie off and hide ends. Gaze lovingly at the darling medalion you have just finished then start its twin. To add beads, add 16 beads to the shuttle to be used for the top rings and the clover-leafs. Pull one bead for each of the top rings and R2 of the clover leaf. 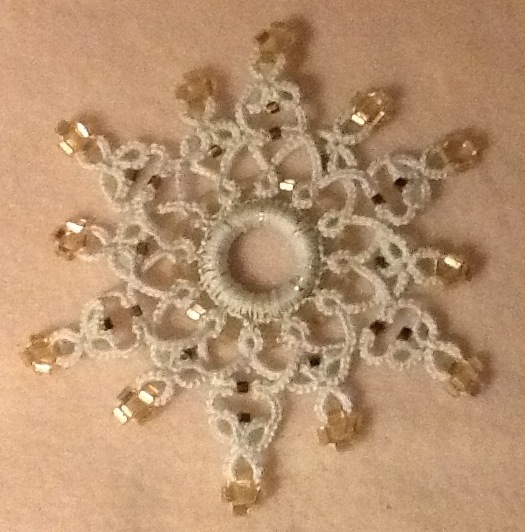 Replace the center picot of each with a bead. Beads can also be added to the joins between the center ring and the bottom ring as the join is created. I hope you enjoy and Happy Halloween! What Were You Working on Last Year? Found an old container in the bottom of my project drawer from last Christmas. 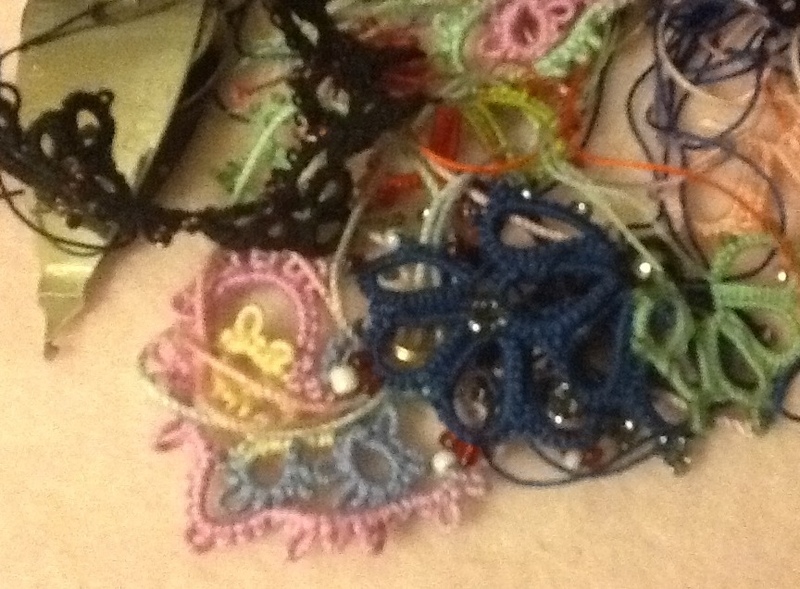 I vaguely remember thinking of giving a bunch of people earring pair and working on the chocker for the kiddo but no idea what the patterns were. What do you have stashed away unfinished? I know I can’t be the only one who does this. Here is my final photo from the TAIS. I never saw it coming. Here is another version of Jane Eboral’s pattern. I wrapped a larger ring and ended up with a 12 point snowflake. Welcome back to the Wednesday Weekly Challenge. 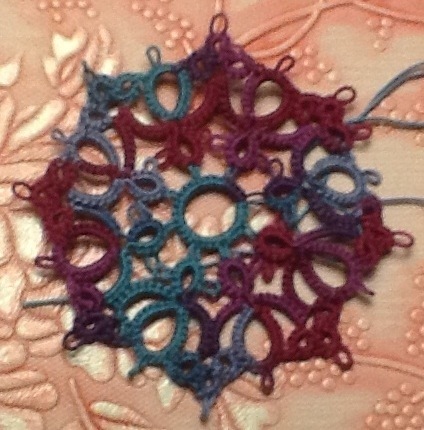 This week’s pattern is from Nancy Tracy. She has designed other Wednesday challenges, including the Kitty cat from week 5. My samples were made from Lizbeth 20, Leafy Green. In my first attempt, I severely underestimated how much thread I was going to need on the shuttle. It looks more like a tree ready to share the stage with Charlie Brown and friends then one for your parlor. 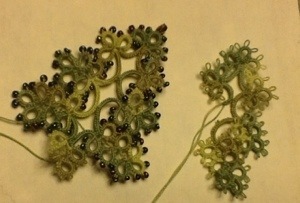 On the second one, I replaced the picots with some five and dime store seed beads. They are all cut a little off so they add a dimension along with some sparkle. (Color me stupid for not adding the following to the original post) For the beaded tree, I added 47 colored beads, 5 sparkly for the top then 47 more. Then all those beads need to be wound onto the shuttle. I tried to fit them all on my bobbin (stop laughing) but of course they didn’t fit so I had to dig out my Starlit shuttle. 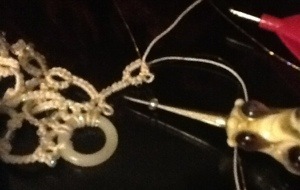 To add the beads to the picots, slide the 2 or 3 beads up onto the thread around your hand before starting each ring. Wherever you would do ascot that isn’t a join, slide up a bead. You can find the pattern for the Christmas Tree as well as several other amazong free patterns on Nancy’s Be-Stitched site. The Christmas tree is in the third column, about 12 rows down. Finally caught back up to date. Here is my piece thru day 10. Still have no idea but I am about to toss it into the trash heap. I don’t know if you all can see it, but my thread broke again when pulling the last split ring. I am going to try and do a Tat-Gyver* on it with the pattern for day 11. Hope your pieces are going better. Tat-Gyver: applying the skills of 80s TV hero MacGyver to a screwed up piece of tatting to avoid the 6th ring a tatting hell, AKA Retro-Tatting. 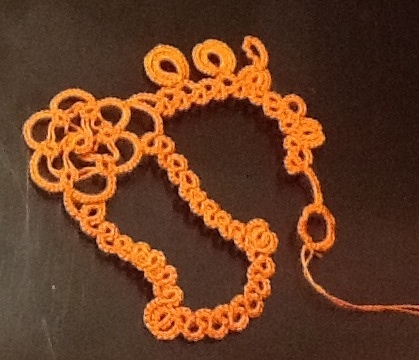 This week’s pattern is from Jane Eborall. We have featured her before. She has amazing free patterns all over her site. This pattern requires a center ring. I used a plastic ring I got this year from workshop. It was a little small, so my snowflake only has 8 points instead of 10. I used white thread and 2 different colors of filament to get the sparkle. 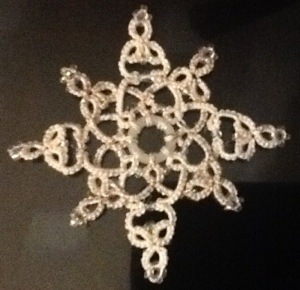 You can find the pattern for this snowflake on Jane’s site, <a Snowflake I am going to try another snowflake tomorrow on a larger ring and will update when I get the size right. I am going to forgo the filament because it is very hard to retro tat. 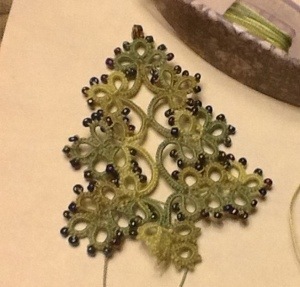 I used a size 14 hook to put the beads on the picots, I included a picture for reference. 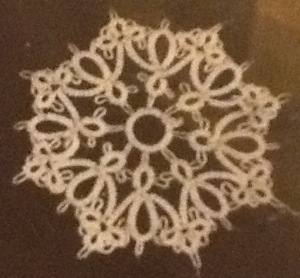 I hope you enjoy this snowflake. With the holidays coming, I see many snowflakes in our future.